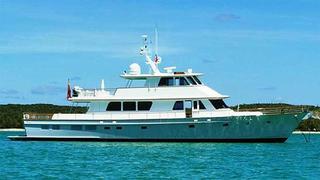 A call to John Cohen at Merle Wood & Associates bring news that he's closed on the 29.26m motor yacht VaKoMaaNo with Joe Bartram at Bartram & Brakenhoff bringing the buyer. Custom-built by New England Boatworks in 2003, she was specifically designed to cruise and explore the shallow waters of the Bahamas and features a rich interior by Candy Langan, with hand rubbed satin varnished teak and cream leather upholstery. VaKoMaaNo sleeps eight guests in two double and two twin staterooms and accommodates four crew in two cabins. VaKoMaaNo was asking $2.4 million.